SOLAR THERMODYNAMIC INSTALLATION AT PORTRUSH HOLIDAY HOSTEL, PORTRUSH. 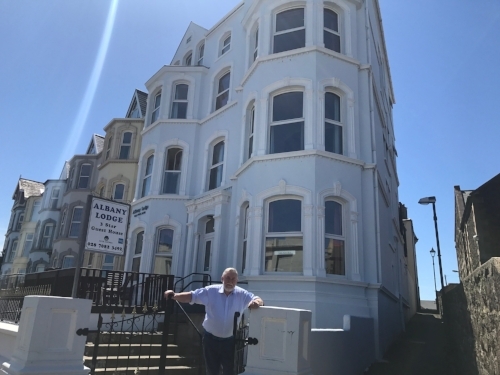 We approached Portrush Holiday Hostel with a view to trying something new and renewable to supply their busy hostel with hot water for their guests. After surveying and assessing the site we proposed two systems including a new cylinder as this would increase efficiency and allow them greater capacity to store hot water. This would increase their savings that they could expect. 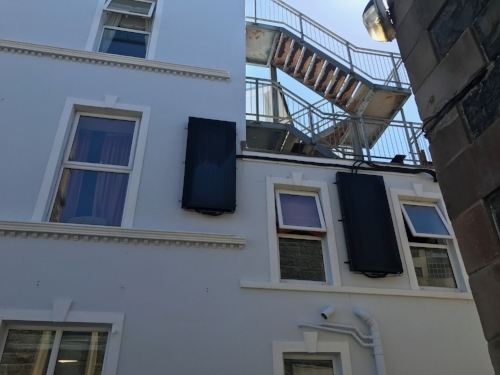 We fitted the panels to the back of the hostel and out of sight and the units were housed in an outside unit. All seamlessly connected and fitted to the cylinder. Portrush holiday hostel are very happy with their system and the savings that the business is having. SOLAR THERMODYNAMIC INSTALLATION AT THE ANCHOR BAR COMPLEX, PORTSTEWART. 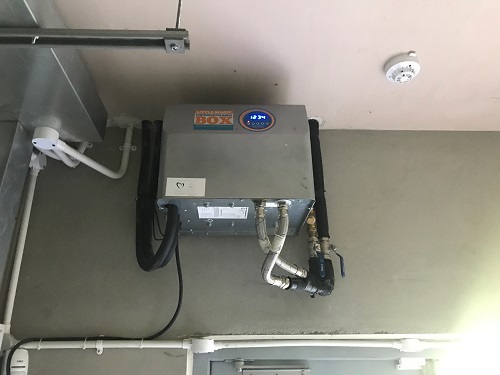 We approached The Anchor Bar Complex with a view to trying something new and renewable to supply their busy complex with hot water for their guests. After surveying and assessing the site we proposed three systems including a new cylinder as this would increase efficiency and allow them greater capacity to store hot water. This would aso increase their savings that they could expect too. We fitted the panels to the back of the complex and out of sight and the units were housed inside close to the cylinder in a store room. All seamlessly connected and fitted to the cylinder by our dedicated fitters and plumbers. The complex has a constant supply of hot water day or night and they don't have to rely on expensive immersion heaters or oil. SOLAR THERMODYNAMIC INSTALLATION AT ALBANY LODGE B&B, PORTRUSH. We approached Albany Lodge B&B with a view to trying something new and renewable to supply their busy B&B with hot water for their guests. After surveying and assessing the site we proposed two systems using their existing cylinder as they already had a large efficient modern unit. This would keep their cost down. We fitted the panels to the side of the B&B and out of sight and the units were housed in a utility room in the B&B. The business had been running on Immersions and oil and now they are very happy producing hot water from their renewables system day or night. SOLAR THERMODYNAMIC INSTALLATION AT DONEMANA CLINIC, DONEMANA. Donemana medical practice are at the forefront of new renewable technology at their new purpose built site. We already had a solar pv system installed with them. We proposed a Solar Thermodynamic system for the clinic which has a high demand for hot water, which was being heated by oil. The clinic had an oppurtunity to save on oil bills and decided to invest in the system. We fitted the system to the exisiting hot water cylinder which was new and didn't need an upgrade. The install took one full day and the clinic now benefits from hot water on demand. SOLAR THERMODYNAMIC INSTALLATION AT LEOS CAFE, DONEGAL. As a busy cafe in Burnfoot Co. Donegal Leos Cafe uses hot water regulalry for their processes. They liked the idea of a renewable technology which would produce hot water all year round given the fact it was expensive for them to heat via oil or using the immersion. To them this solution was a no brainer and they quickly decided to install a system. In this case, the cylinder was in a tight space and very old. So we had a cylinder made especially for this area and in doing this we increased the efficiency of the system. All fitted in 1 day without disruption to the business.